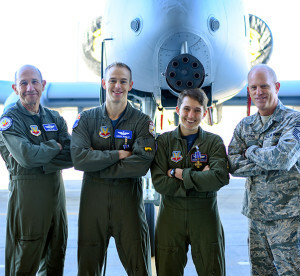 Gen. Mike Holmes, commander of Air Combat Command, Maj. Tyler Schultz and Capt. 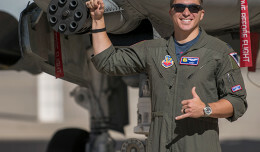 Samantha Harvey, 354th Fighter Squadron A-10C Thunderbolt II pilots, and Chief Master Sgt. Frank Batten III, command chief of ACC, pose for a photo at Davis-Monthan Air Force Base, Ariz., March 2, 2018. General Holmes presented Schultz and Harvey with the Distinguished Flying Cross for their heroic actions in support of U.S. Army forces near al-Shaddadi, Syria, on May 2, 2017. Two A-10C Thunderbolt II pilots received Distinguished Flying Crosses during a ceremony at Davis-Monthan Air Force Base, Ariz., March 2. Gen. Mike Holmes, commander of Air Combat Command, presented Maj. Tyler Schultz and Capt. Samantha Harvey, 354th Fighter Squadron pilots, with the aviation decorations for their heroic actions in support of U.S. Army forces near al-Shaddadi, Syria, on May 2, 2017. The DFC is awarded to any officer or enlisted person of the U.S. Armed Forces who has distinguished themselves in combat in support of operations by heroism or extraordinary achievement in flight. Schultz and Harvey displayed superior flight leadership and exemplary Airmanship while engaging fighters from the Islamic State in Iraq and Syria during a close air support mission in support of Operation Inherent Resolve. When a U.S. joint terminal attack controller reported that his team was surrounded and under intense direct fire, Schultz and Harvey immediately located the friendly forces and began to assess the enemy’s coordinated attack. Harvey descended in her aircraft in an attempt to display a show of force to deter further enemy aggression while Schultz executed four strafe runs directly onto the enemy threat. 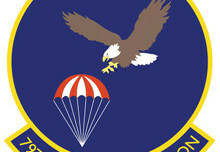 Harvey’s flight leadership and Schultz’s response under pressure resulted in saving over 50 U.S. personnel with zero casualties.